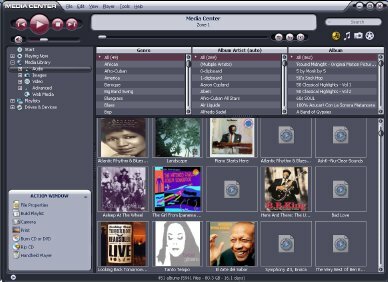 MEDIA CENTER 10 has a new layout that includes a new skin, media mode controls, and an improved graphical Action Window. How does mediacenter store the track rating? I've been rating my songs with foobar under %trackrating%... Got mediacenter for my sister because it'll be easy for her to put stuff on her creative ipod-thing... but is there any way to get mediacenter to read my %trackrating% tag? Or any tag really, I treid just %rating% and whatnot and its not showing up anywhere. Mediacenter actually isn't tagging any of my files... Last time I tried mediajukebox it threw in 1000 tags (one reason i stopped using it) Is it al done in a database now? It's stored in the file itself, as are most tags. If you go to "File Type Info" in the action window you'll see it there. I am sure you can use Foobar's masstagger to copy the rating over. I use it to copy the foobar album gain over to MC's replay gain and it works great.